Over the weekend our household was the recipient of a new dishwasher. What does a dishwasher come in? A big box. I think the installers were a bit surprised when I asked them if the could leave the box here. The took out the dishwasher and made me come double check that the box that was left, was what I wanted. 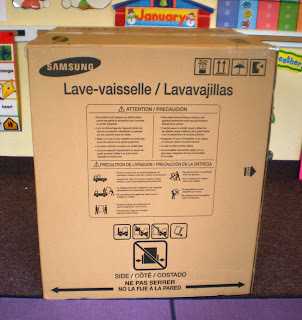 On Tuesday I took the box to school. 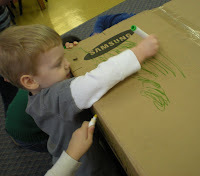 We all know how much fun a box is to little ones. The AM class got a big blank box. I asked them what we should do with it. They all said it needed a door so they could get inside. 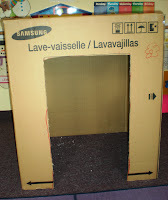 I cut out a door and then they wanted to know how it was going to be dark inside if I cut a hole in it. I explained that we needed something with a bit of light in it. Then someone said to cut in windows. I asked what shapes and they said a circle and a square. So two windows went in. 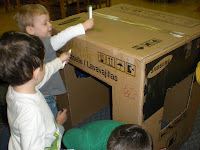 Then, someone said let's make it a race car and told them they could do what they liked with it at playtime. 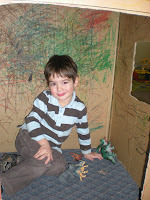 During playtime I set it out with markers in case anyone had decorator fever. Here's where there was a wrinkle in the plan. I didn't think I needed to watch too closely as I really didn't care what they colored on the box. 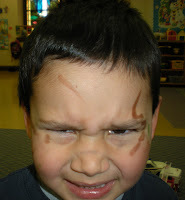 The next think I know a little one comes up to me with scribbles on his face. They were actually in the box coloring EACH OTHER. So after some clean up and a bit of clarification they were back in business. 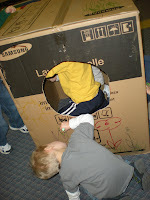 Both classes had a great time being in the box and decorating it. They can't wait to do it again tomorrow. 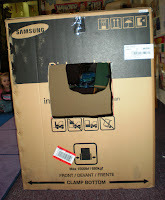 I just hope the box makes it through the day with the Pre-K class. It would be great to have a new box every few months or so to add some excitement to the day! We got a new washing machine over the holidays and the delivery guys not only left us our box, but tossed in an extra box to boot. They've finally about had it, but what fun! 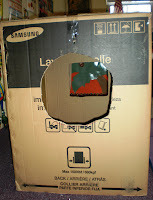 One of our local appliance dealers will save boxes for us as long as we pick them up without delay. Fridge boxes are the best! Love the pictures! They obviously had a blast! Love it! 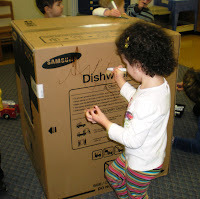 We had a dishwasher box that held up for months and the children had so much fun with it! What fun! Boxes are the best. It's time for my class to have a large box again. How fun! 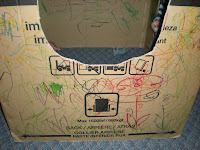 We did this over the summer with big boxes outside and some paint. It's so much fun to watch the kids imaginations at work! Oh - you just gotta love having a big box!